Parsons SCE is proud to share Natalia Vlachopoulou and Jon Q Ye of the ID program were selected by Yves Delorme to design a spring “takeover” of their showroom this season. As part of this opportunity, they will be guests of Yves Delorme in Paris to view their manufacturing facility and speak with textile designers in France. Natalia and Jonny will speak about their design in a conversation moderated by Yves Delorme’s Couture Designer, Jerome Delmas. 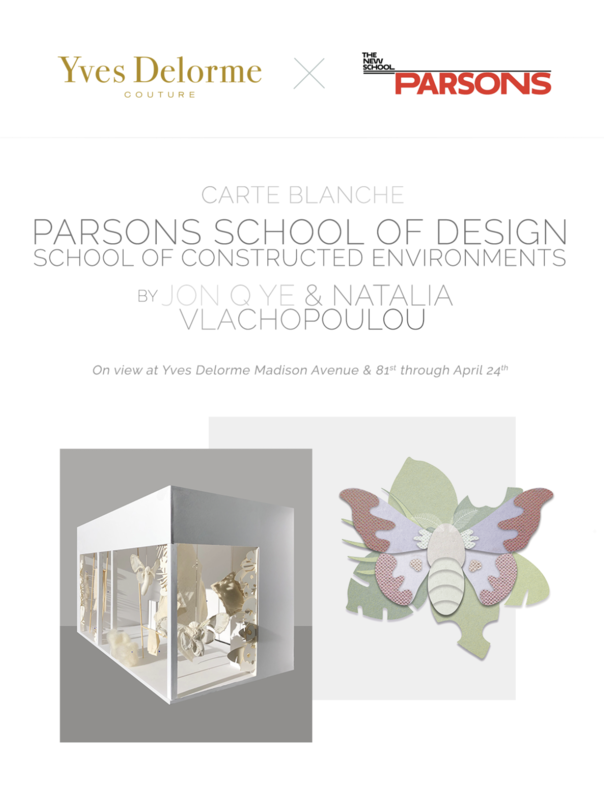 Please join Parsons SCE in toasting Natalia and Jonny’s work and the collaboration with YD this coming Tuesday, April 2nd at 6pm at 1070 Madison Avenue (at 81st Street). Please RSVP to Madison@yvesdelorme.com.